Are you unable to access your device because frp lock? 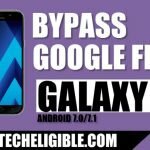 if you forgotten your google account, or you bought used device, so surely after hard reset you will face factory reset protection on your Galaxy A6/A6 Plus device, but now you can Bypass FRP Samsung Galaxy A6 and A6 Plus Android 8.0 device, follow below steps cautiously to access back your Samsung galaxy device. Note: This method has successfully been applied on Sasmung Galaxy A6 (SM-A600) / Galaxy A6 Plus (SM-A605) Android 8.0 2018 device. -We need have to flash our device to successfully Bypass FRP Samsung Galaxy A6 / A6 Plus. -If you are new in this, don’t worry just follow below steps carefully, everything has been mention in this post. -First you need enter into recovery mode of your device. -For entering in recovery mode, press & hold (Volume UP + Power) together, and release keys immediately once you (Samsung Logo) on your screen. -Now wait, until you enter into recovery mode. Note: If you see a screen of (Dead Android Logo), then press (Volume Down) key to enter into “Android Recovery Mode”. -In android recovery mode, you will be able to see there “Firmware CODE” (See below image). -Write down your “Firmware CODE”, you have to download “Combination Firmware” by matching your device firmware code. Remember: It does not matter whether last 2-3 code matches or not, make sure starting digits and android version is matching with your firmware code. -Make sure below firmware is matching with your Galaxy A6/A6 Plus device firmware. Note: if last 3-4 digits are not matching with your firmware code, so no problem you can download firmware if rest code is matching, except the last 3-4 codes. -Keep your downloaded “Combination Firmware” on your computer desktop. -Now we have to download official stock firmware. -Open your internet browser in your computer. 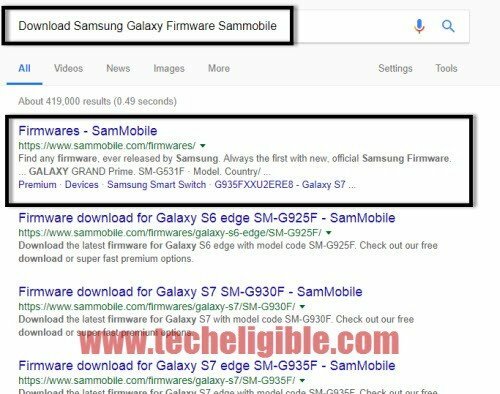 -Type in search bar “Download Samsung Galaxy Firmware Sammobile“. -Go to very first search result (See Below Image). -Click on “JOIN” at top right corner to sing up your account there, if you have samsung account already then click on login to login your account there. 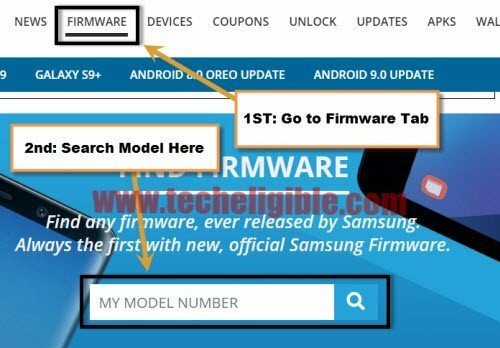 -Once you logged in successfully, now you can easily download any official stock firmware from sammobile site. -Click on “Firmware” from menu bar. -Search your “Model Number” there. -Scroll down, and select your device country. -Now select your device “Official Stock Firmware” from list to download. -Once downloading finish, keep your “Official Stock Firmware” file on desktop (See Below Image). -Download “Odin Software” from below in your computer. -Extract both downloaded “Official Stock Firmware + Combination Firmware“. 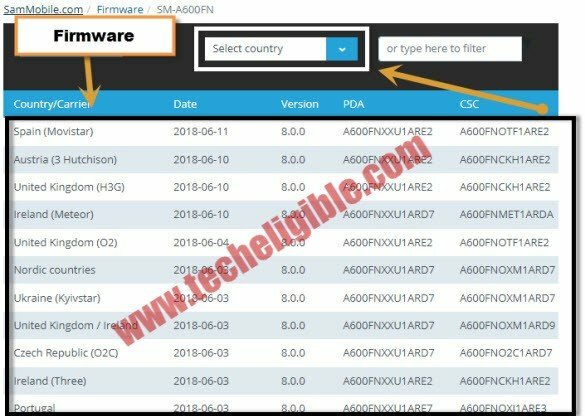 -Click on “AP” and give file path there of “Combination Firmware”. Note: Make sure your combination firmware file extension is (.tar), if it’s not so change it to (.tar). -Now you have successfully given file path of “Combiantion Firmware” in your computer “AP” tab. -Press & hold (Volume UP + Power Key) together. -Once you enter into “Recovery Mode”, select option from there “Reboot to bootloader”. -Now you will have “Samsung Logo” on your screen, that means you are now in bootloader. Note: If you are unable to put device into “bootloader’, then put device into “Download Mode“. -Connect device to computer by using good quality micro usb cable. -Once device connected to the computer successfully, you will hear a sound, and you will see in odin software, that “ID:COM” will turn to blue, that means device has been detected by odin tool. -Click on “Start” button to start flashing process. -Once you see “Pass!” sign in Odin tool, that means flashing process has been finished. -Device will auto restart to “Factory Binary”. -Now you will have “Yellow Screen”, on which you will be able to see your device model number as well. -Bring “TOP Bar” option on your device by swiping from up to down. -Select “Settings gear icon” from top right corner (See Below Image). -Go to > SYSTEM > ABOUT PHONE. -Tap 7 times quickly on “Build Number” to enable developer options in your Galaxy Device. -Go back to “System”, there you will be able to see “Developer Options”. -Go to “Developer Options”, and then enable “OEM unlocking” option from there. -Once you enabled that, now switch off your device. -First of all we have to change “MD5” extension from all “Official Stock Firmware Files”. -Go to “Official Stock Firmware” folder. -There you will be able to see “5 files”. -Just change their file extension from (MD5 to .tar). Note: You only have to remove “MD5” if .tar extension is already there, otherwise add .tar extension manually. -One you change all files extension, lets start to Bypass FRP Samsung Galaxy A6/A6 Plus. -Click on “BL” from odin tool, and give file path there of “BL FILE” from official stock Firmware folder. -Now Click on “AP” from odin tool, and give file path there of “AP FILE” from official stock Firmware folder. -After that Click on “CP” from odin tool, and give file path there of “CP FILE” from official stock Firmware folder. -Click on “CSC” from odin tool, and give file path there of “HOME CSC” from official stock Firmware folder. Note: Make sure you are giving file path of “HOM CSC File” in odin “CSC Tab”. -Click on “Start Button” to flash galaxy device. 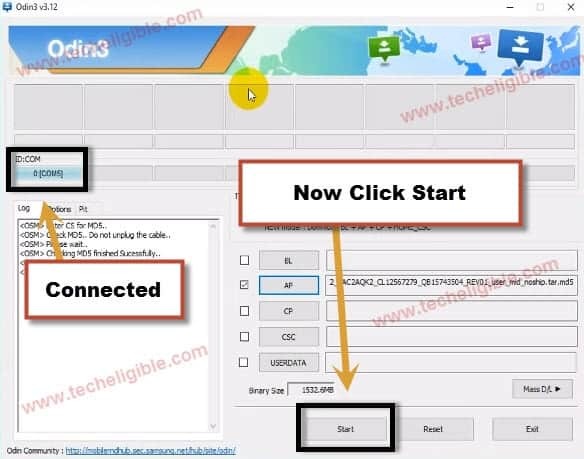 -Once flashing process finish, disconnect your device, and congrats you have successfully accomplished this method to Bypass FRP Samsung Galaxy A6 and A6 Plus. -Let your device to restart & complete initial setup to access home screen. -Extract both firmware in your computer desktop. -Download “Odin Software” for flashing with. -Change File Extension of both downloaded firmware from .MD5 to .tar, make sure there should be only one extension and that should be .tar. -Flash Galaxy A6/A6 Plus device with Combination Firmware. -Enable “OEM Unlocking” from your device. -Flash Again with “Official Stock Firmware”. Hi should i follow these steps to unlock my A6 + which is network lock/ sim lock, its malaysia samsung i want to use it in germany.